or, how we make pickled eggs! The method is pretty wordy, ideal for printing, but if you would prefer a more visual method of how to make pickled eggs, try our other method here. Each jar above contains 2 duck eggs and a few hens eggs. There are 3 flavours; Plain, Beetroot, Chilli & Ginger. 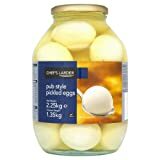 There are a few essential things you will need to make pickled eggs, some you can use again and again, some are ‘one use’ wonders. Basically, you will need kitchen equipment, jars, pickling vinegar, flavourings and eggs. You’ll need; A stove of some sort, saucepans, silicon ended tongs, a big spoon, a colander. Any old jar will do as long as the lid still fits properly, but we use preserving jars. Preserving jars have a metal clasp, a glass lid and a rubber sealing ring. There are a number of companies who make these, and they come in a huge range of sizes. Kilner in the UK, Fido in Italy and Le Parfait in France. Kilner and Fido have square sides while Le Parfait jars are round… take your pick. We find it better to make a few small jars of eggs rather than one large jar. An advantage is that you can then flavour each one differently. The eggs will mature over time, so the ones at the bottom of a big jar will have a stronger but smoother flavour. 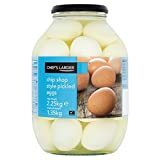 The problem we find with a large jar of pickled eggs is the sheer number of times you will have to disturb it to get an egg out. Disturbing the jar seems to stir up the bits and bobs from the bottom of the jar which then clouds the vinegar. This doesn’t seem to affect the flavour but doesn’t really look too nice. 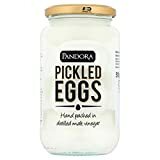 Also, the more times you open the jar, the more likely you are to introduce something which will taint the eggs (just look at the butter after you have had some Marmite on toast a few times). Any vinegar will do, however, normal brown vinegar will stain the egg and give it a much stronger flavour. We use clear pickling vinegar. This is a good base to which we can add any flavourings we like. There are no hard rules for flavourings. It’s best to start off simply with no flavours, then experiment as you become more confident. This is another reason to use small jars, you can make a lot of different flavours at the same time to test them out. Any eggs will do. Free-range eggs are a must (just because we are pickling them, it’s not fair to forget the animal that supplies us). Some people advise using week old eggs, but we have not found any discernible difference between fresh or week-old ones, just make sure they are not too old! This time we used fresh medium size hens eggs sourced from Epping market, they are cheaper than the supermarket and it supports the local community. In the past, we have also used quail and duck’s eggs, but have not tried an ostrich egg (yet!). Quail eggs turn out really nice but are easily eaten in one bite which seems a bit of a waste. Duck eggs are larger than Quail’s and Chicken’s eggs, however, they do have a rubbery texture to the white, which is not to our liking. The yolks turn out really creamy, less texture than the chicken’s egg. It’s up to you. The jars need to be clean, very clean, sterilised in fact. place the jars in a saucepan of boiling water, one at a time is easiest, so you don’t have to use a massive saucepan. After 10 minutes you can remove the jars with the tongs (silicon ends help grip the glass) and leave somewhere clean to drain and to dry. The jars will dry themselves because of the heat from the boiling water. make sure they drip dry by draining upside down, water is not a pickler’s friend (This is why you salt vegetables before pickling, to remove moisture). The key to this process is NOT to touch the jars. Keep anything that might be dirty away from them. Click here to read another method for how to sterilise jars ready for preserving. Clear pickling vinegar states that it is ready to use, however, we like to give it a quick boil. When the vinegar is boiling you can add the flavourings. Whatever you choose, make sure the ingredients are fresh, clean and if large, cut them up into smaller pieces. Some flavourings can physically stain bits of the egg if they are left in contact with them, which can make a nice effect. Make sure the eggs are clean and feather free, They should be at room temperature for boiling. This reduces the chance of them cracking when put into the boiling water. If you get them from the fridge, they are more likely to crack and cooking times must be adjusted accordingly. Turn on your cooker / light the gas. Put saucepan over the heat. Put water in the saucepan (boil this beforehand using the kettle if you want to save time). Add a few tablespoons of vinegar to the water. This will coagulate any egg white if the egg should break and leak its contents. Add the eggs, one at a time, gently lowering them into the water with the big spoon. If any crack, the vinegar will stop the white from spreading. Boil the eggs for 20 minutes. Half way through the boil, gently move the eggs around in the pan to make sure they get even heating. You can boil them for longer if you have a large number of eggs in one pan as these will lower the water temperature when added. Pour most of the water away and run the eggs (still in the pan) under cold running water to stop them cooking (this also stops the grey coating you sometimes get between the yolk and the white). Using a spoon, crack the eggs all the way round (but don’t peel yet) and leave them in the cold water to cool. This lets water in under the shell and helps when peeling them by lifting the shell away from the egg. If the eggs heat the cold water, which they probably will, replace the water with more cold as necessary. Once cold, peel the eggs and place them into the colander to dry. Put the dry eggs into your clean dry jar, trying not to touch them. You will need a lot less vinegar than you think, remember, most of the jar is taken up with eggs. You can add ingredients to cold vinegar, but we tend to add then to the boiling liquid, this seems to help the flavour permeate the vinegar. Always mix the vinegar with your flavourings before adding to the jar. If you add them separately you tend to get clumping of flavourings which can flavour one egg more than others. Pour the cold mixture over the eggs, making sure you cover them completely. If you have too much vinegar you can sieve it and add the remaining solid ingredients to the jar at the end. The eggs at the top will sink as time goes by, so don’t worry if some float. Store the jar in a cool / dark cupboard for six weeks. Try not to move it. 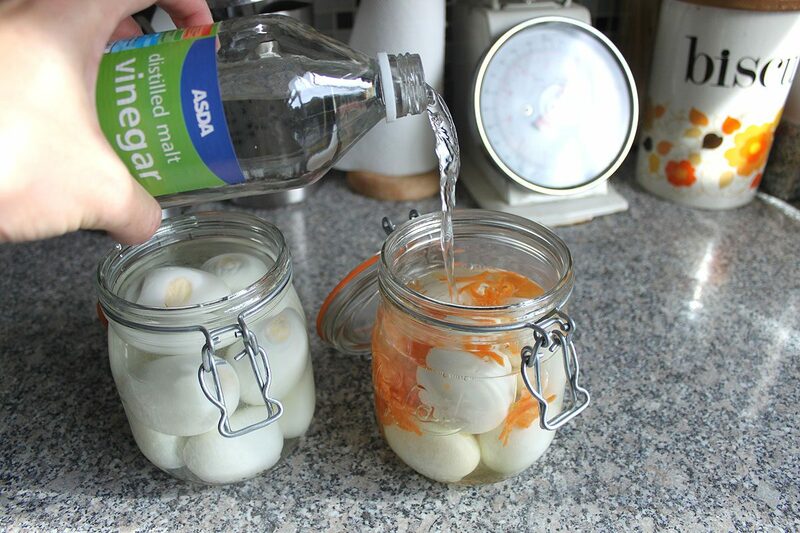 You can eat the eggs as soon as you like, but if you do, they’ll just be boiled eggs in vinegar, not properly pickled. We suggest that six weeks is a good minimum to let the flavour permeate the eggs. Get them out of the jar with a clean spoon (EVERY TIME), try not to stir up the liquid. Stick them in your mouth.